Monster Cards are used to increase the base stats of you character. To do this, you must find, buy or craft cards that contains the specific Stats that your character needs. The higher, the better! Note that you can only equip specific cards into their allowed respective equipment, and each equipment will have their own available cards slots too. To learn more about cards, refer to the guide below. - Most monsters randomly drops their card as loot (luck based). - Some higher grade (VVS or VVVS) monsters will also drop Rank 4 cards! compound them to get better cards. See Compounding Cards section below. - This is also a very good way to earn fast Zeny! feature. Note that prices may vary per server. - Browse and see what you think is best for your character. 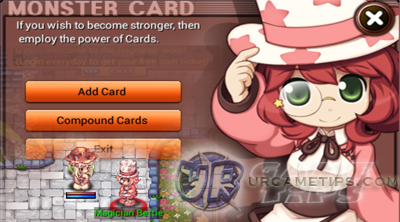 - Equip Grade 2 or 3 Cards into your short term use equips (Around Lvl 1~30). - Equip Grade 3 or higher Cards into your long term use equips (Above Lvl 30). price value of those items when you sell them will go down, than what it should be. More players would also love to buy it if you did good! one. This is the only way to get Special S cards. Good Luck! into your equipment, or Compound Cards and upgraded them up to Rank 4.
if you are VVV Unlucky!. Note: All items used will be lost too, so do not use cards that you need. 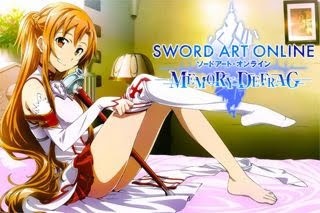 - A material that is used for compounding Rank 1 ~ 2 cards. - Merchant: Price: 800 Zeny each. 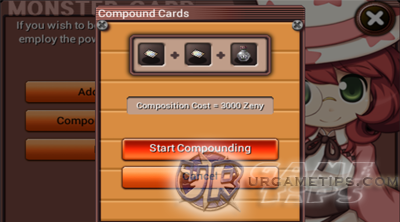 - A material that is used for compounding Rank 3 cards. - Cash Shop Price: 5 pieces = 10 Rubies. other players to get more Zeny. Good Luck compounding new cards!